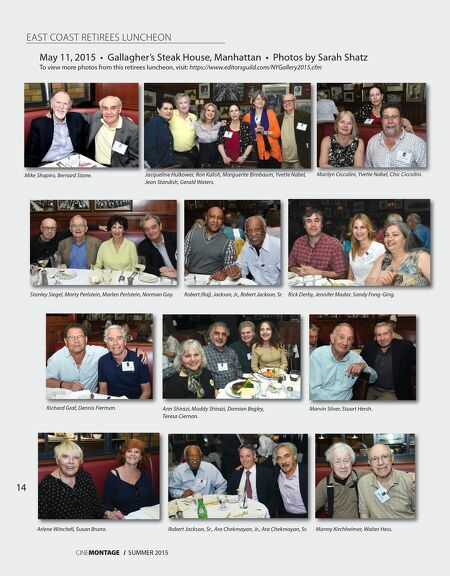 15 SUMMER 2015 / CINEMONTAGE 15 SUMMER 2015 / CINEMONTAGE May 17, 2015 Sheraton Universal, Universal City Photos by Deverill Weekes To view more photos from this retirees luncheon, visit: https://www.editorsguild.com/LAGallery2015.cfm WEST COAST RETIREES LUNCHEON Marion Ottinger, Art Ottinger, Marlee Morris. Janice Ricotta, Dennis Ricotta. Daniel Mc Donough, Judy Mahoney. Richard Lane, Gloria Lane, Stacy Wheeler. Bernie Wolf, Alize Wolf. Cheryl Pruet, F. Hudson Miller, Patricia A. Kennedy. Renee DiGregorio, Albert Zuniga. Bill Lowe, Michael Hall. Michael Sheridan, Helen Downs, Jack Tucker, Victoria Hamilton, Maureen O'Connell. 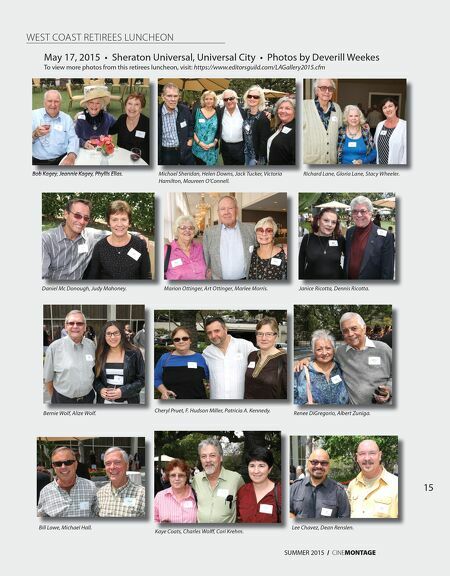 Bob Kagey, Jeannie Kagey, Phyllis Elias. Kaye Coats, Charles Wolff, Cori Krehm. Bob Kagey, Jeannie Kagey, Phyllis Elias. Lee Chavez, Dean Renslen.